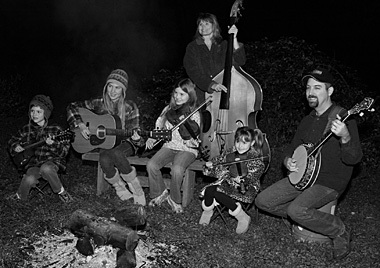 The Anderson Family, from Grass Valley, California, performed as a crowd-pleasing northern California bluegrass band since their start in early 2005 to 2013. Mark and Christy Anderson and their four kids, Paige, Aimee, Ethan (Bo) and Daisy, made new friends and fans every day with its unbeatable combination of outstanding lead and harmony singing, impressive instrumental abilities, savvy stagecraft and boundless energy and charisma. The Anderson Family's story as a band dates to the family's 2001 move to Grass Valley, a northern California town steeped in gold rush history. The Andersons live about 10 minutes from the fairgrounds where the California Bluegrass Association holds its annual festival—the first festival the whole family attended was in 2001, when Daisy was just 8 1/2 weeks old. At the CBA festival in 2003, Paige and Aimee were inspired by a performance of "Kids on Bluegrass," the CBA's popular program for very young pickers. Shortly after that festival, Paige started taking guitar lessons so she could play along with Mark, a fledgling banjo picker. Aimee picked up the fiddle a couple of months after that, starting out on a quarter-size instrument and also taking lessons. By the 2004 festival, Paige and Aimee were participants in "KOB," gaining valuable musical and on-stage experience and performing tunes the sisters had spent months working out. As Paige recalls their debut, "When our turn came, we walked out on the stage and played our first song and got a huge response. Aimee and I looked at each other with really big smiles on our faces." It's fair to say the band was born at that moment. Christy started playing the upright bass, after a false start on the dobro. Ethan picked up the mandolin, enthralled by the picking of Bill Monroe. Daisy started out fiddling on the quarter-size fiddle Aimee had outgrown, displaying an unerring sense of rhythm at a very young age. The family started playing in public early in 2005 and it’s been full speed ahead since then. The band’s first CD, Anderson Family Bluegrass, was released in 2008. Containing such audience favorites as "Sounds of Loneliness," "Green Pastures," "Wild Bill Jones" and "Get Down On Your Knees and Pray," the album has met with critical and popular acclaim. In his liner notes, award-winning music critic Jon Hartley Fox pointed out a special part of the band’s appeal: "The Anderson Family is the rare band that sounds better and more musically together every time you see it perform. Every single time—even if it's only been a week since the last time…The sky’s the limit for my young friends." The band typically performs throughout California to Washington, Nevada and Arizona at many prominent venues, bluegrass festivals, radio stations, TV stations, and numerous other events. 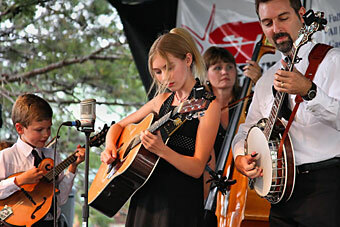 In June 2008, the Anderson Family won the Best Bluegrass Band award at the Northern California Artistic Achievement Awards ("The Grassies") in Nevada City, California.